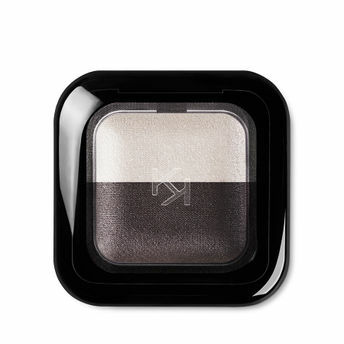 Kiko Milano Baked eyeshadow duo is ideal for both wet and dry use. The product imparts bright, rich and buildable colours. The compact's two colours can be used alone or combined for a striking look. Baking the powder creates a smooth, creamy and uniform texture that adheres well. It feels wonderful, delightfully soft to the touch. The formula is enriched with jasmine, camellia and rose.The eyeshadow comes in a modern, practical and unique compact featuring the KK monogram and a magnetic closure. The eyeshadow exclusive packaging also allows it to be used in a removable system. You can remove an eyeshadow from its compact and insert it into the new Shade Selection 03 palette. Magnets hold the eyeshadows in place. The palettes are stackable and sold separately. Each elegant palette holds three eye shadows and comes with a double-ended sponge applicator and a mirror. The eyeshadows can be removed from the palette and replaced with others to create endless colour combinations and personalize your look. Available in three different finishes: matte, pearl and metallic.The 24 colours are designed to allow you to mix and match shades depending on the occasion. Alternatively, you can also find many more products from the Kiko Milano Bright Duo Baked Eyeshadow range.